Bingo Time | Claim a 100% Match Bonus NOW! The race is on at this Dragonfish powered online bingo site. Bingo Time is clearly defined as a site for those gamers in a rush, and its layout clearly incorporates that into effect. 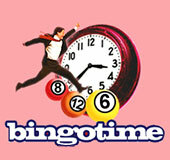 At present Bingo Time features nearly ten promotions and bonuses for you to get your hands on. New players at Bingo Time are treated to a generous 100% match deposit bonus, for deposits between a tenner and a hundred quid. As far as their other promotions go, Bingo Time is offering new players the opportunity to get a 50% deposit bonus, every time they top up their account, and also features £6,000 free-4-Alls every month. This is a great way to play free bingo for real cash. 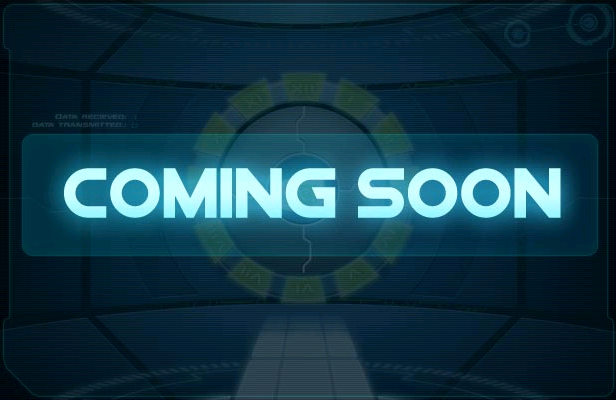 Currently on www.bingotime.com, the site is also hosting £1m coveralls, £100 daily jackpots and up to £50,000 in jackpots every month. To join Bingo Time today just follow these steps – it's quite simple! 5. Begin to spend your bonus, and win! Bingotime is currently running their New Year Calorie Buster promotion, with could see you in with a chance to win free gym equipment, to held you shed those stones this year. That aside, Bingo Time is also offering weekend promotions, team bingo, and happy hours to get your exciting Bingo Time site adventure under way. As far as games go, Bingo Time has both 75 ball bingo and 90 ball bingo for you, as well as less conventional bingo site games such as super slots, slot machines, instant win games, progressive jackpots and video poker. 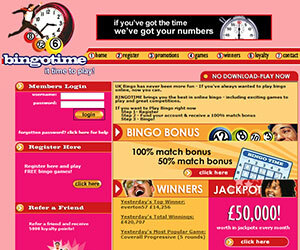 Bingo Time also accepts payment from many of the most common online bingo site payment methods. Visa and Mastercard, Solo and Switch, Maestro, Netellers and PayPal are all commonly accepted forms of payment at Bingo Time, and they will also even allow you to play bingo using U Kash. If you have any questions, don't hesitate to call their customer service team, available 24/7. If you're looking for a quick bingo experience on the go, then look no further than Bingo Time. If you've got more spare time than busy time on your hands, why not try our Lord Bingo's list of brand spanking New Bingo Sites today, to see if there is something else to your liking?